Tamara Lanier's lawsuit says the school is "perpetuating the systematic subversion of black property rights". Harvard spokesman Jonathan Swain told the Associated Press the university "has not yet been served, and with that is in no position to comment on this complaint". Ms Lanier, a retired probation officer who claims to be the great-great-great-granddaughter of Renty, asks in her lawsuit for Harvard to return the images to her family, pay unspecified damages to her and acknowledge that it was "complicit in perpetuating and justifying the institution of slavery". It remains unclear whether Ms Lanier can prove her genetic lineage to the man she calls "Papa Renty" and grew up hearing bed time stories about. "What I hope we're able to accomplish is to show the world who Renty is," she said at a news conference in New York City on Wednesday. "I think this case is important because it will test the moral climate of this country and force this country to reckon with its long history of racism." According to her complaint: "By denying Ms Lanier's superior claim to the daguerreotypes, Harvard is perpetuating the systematic subversion of black property rights that began during slavery and continued for a century thereafter." The images were discovered in 1976 in a storage attic at Harvard's Peabody Museum of Archaeology and Ethnology. "That photograph is like a hostage photograph," he said. "This is an enslaved black man with no choice being forced to participate in white supremacist propaganda - that's what that photograph was taken for." 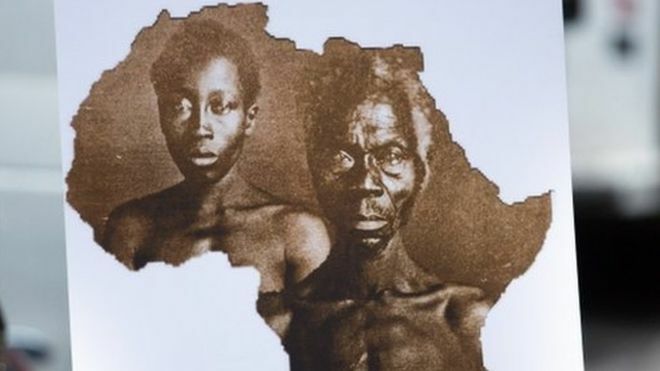 A lawyer for Ms Lanier, civil rights attorney Benjamin Crump said: "These photographs make it clear that Harvard benefited from slavery then and continues to benefit now. By my calculation, Renty is 169 years a slave. When will Harvard finally set him free?" In 2016 a member of Yale University's kitchen staff was arrested after he smashed a stained glass window depicting slaves toiling in a field, telling police that "no employee should be subject to coming to work and seeing slave portraits on a daily basis". In 2017, Georgetown University in Washington DC apologised for selling 272 slaves in the early 1800s and offered an admissions advantage to the descendents of the men, women and children who were sold in order to cancel the university's debt.